[img]http://www.biologic.xyz/downloads/images/antibodydbscreen_thumb.png[/img] is not a valid Image. 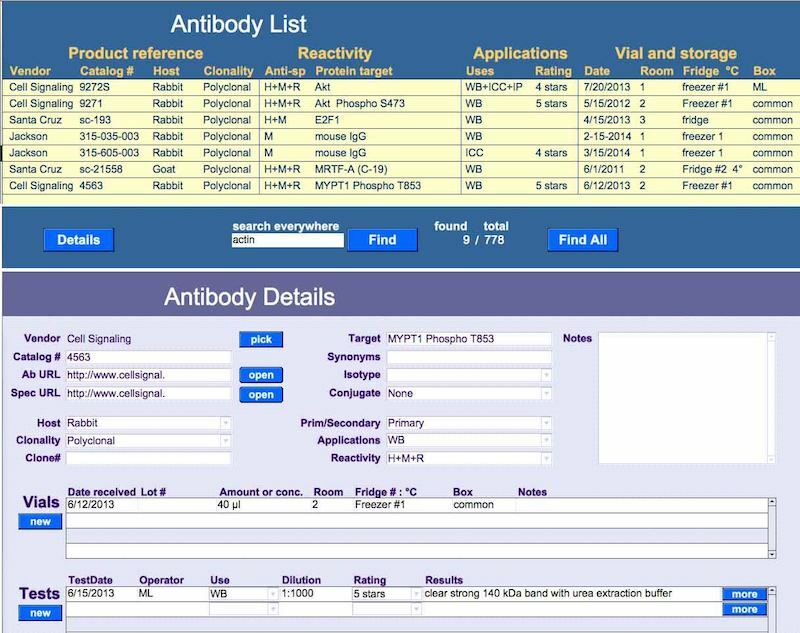 A relational FileMaker Pro database for lab antibodies. Tracks antibody specifications, orders, lot numbers, storage, users, test results (including pictures) and ratings. Written with FileMaker Pro Advanced 11. Use either the database file (http://www.biolog...aseFP7.zip) or the standalone runtime app (download link below). The database is a small file that can be modified with FileMaker Pro 7 or later. The runtime app works without FileMaker, under Windows XP or later.